Bill Paxton is one of my favourite ever actors. I was shocked to hear that he'd passed away yesterday. I was walking past my radio when I heard the words "Bill Paxton", "61", "complications". And I stopped dead, listened hard and then repeated it. No way, not Bill. Not Hudson. I'm not one to fill my social media feed with sorrow when a celebrity dies but this feels different. I can't put my finger on why, but I think it has something to do with the fact that Bill Paxton wasn't a leading man, was never a top billed film star, and for whatever reason never seemed to get the public credit I think his acting deserved. What he did was turn up in films and out act pretty much everyone else. He created characters that stayed with you and could be funny, charming, frightening and downright entertaining. And because of all this, I somehow felt he was something of a secret that only I was privy to. Having talked with friends today it turns out that they feel the same. Somehow, people who loved his films had a personal connection that made it feel as if they knew about this great actor that no-one else really noticed despite him being in some massive films. When you look at the relationship he had with James Cameron, it feels as if this is an actor that the director kept coming back to time and again. Whether it be the young punk in Terminator, Hudson in Aliens, or turning up in Titanic and True Lies, there was certainly a bond between the pair. And it's some testament to him that he almost entirely stole Aliens. His turn as Hudson is brilliant, and doesn't dim despite how many times you watch it. In turn cowardly, whinging, mealy-mouthed and cynical, he eventually shows he is all Colonial Marine when he goes out in a blaze of glory taking as many Aliens with him as possible. The most quotable moments in that film are all his. And he makes a potentially one-note space marine into something much deeper. He even made Navy Seals worth watching. He is one of those actors who adds a lustre to bad movies. I can't wait for his scenes, hell, I can't wait for his minor roles either. Whenever I watch Commando not only do I get a thrill from classic Arnie, but I get a warm glow whenever I know the radio operator is about to get a line (because it's Bill in an early role). Ridiculous? Definitely. But I suppose that's fandom for you. And yes, Navy Seals was appalling. But in the opening scene a Seal under heavy fire calls out "God"? And whilst you're thinking he's after divine intervention the film cuts to a close-up of Bill in a tower, with a sniper rifle, who responds with "God here" and dispatches the foe with Old Testament justice. I think I did an air punch when I first saw that! For my money, Aliens is still his best role. Or rather, it's the one that has had the biggest impact on me. But then he also came close to stealing True Lies with his turn as a not so secret agent; One False Move saw him play the stalwart local sheriff; in Near Dark (or Aliens Reunited as I like to think of it) he played an unhinged Texan vampire; The Lords of Discipline saw him play a thoroughly unlikeable character brilliantly; Tombstone added real grit to an already impressive range; and Weird Science has to get a nod as one of the best performances of a complete jock duschbag. 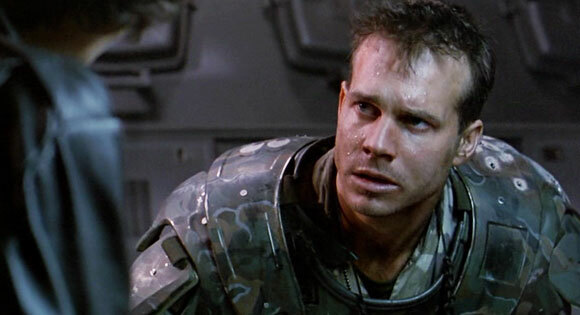 So it's sad to think that there won't be any more films starring Bill Paxton. 61 is no age to go. But I'll always have a soft spot for Hudson. Hudson remembering that he is actually a Colonial Marine. I'm intrigued when parents actively let their children watch films that are too old for them. And by this I mean letting children watch films that are certificated very plainly above their current age range. I'm not talking about teenagers, I'm talking about kids under ten years old. I'm of the view that films have certificates for a reason. They are there to help viewers understand, at a glance, how suitable a movie is for watching. What I've observed comes down to one major factor: I see an awful lot of parents of my age who really want their kids to be interested in the films they love. These are mostly the films or comics that we grew up with in the 1980's, and that have been brought bang up to date with modern interpretations. The difference is that these films often cater to a more mature audience than we were when we watched them as kids. There is a tonal difference in these films that has been reflected by the certificate on the film. My personal example is Star Wars. My son loves Star Wars. And I love that he loves Star Wars but he hasn't watched Revenge of the Sith (certificate 12 and featuring the decapitation of Dooku as well as the pain-wracked almost burnt alive death of Anakin). I know what you're thinking, "calm down Dom, they're just Star Wars movies". Whilst I'm happy for my seven year old to watch space battles, light sabers and ewoks, I don't believe he need to watch a grim-themed science fiction universe for an audience five years ahead of him. Can I go home daddy? There was another example of this when I went to see Avengers Age of Ultron at the cinema. A parent in the audience had turned up with two children, one probably about eight and the other around four. The four year old definitely didn't want to be there but dad was insistent that he wanted to watch this film. And here's what annoyed me: if he was really are desperate to watch the film, he should go and watch it. But at least make an informed choice as to whether it's suitable for his children. Don't take them without understanding if the film is even suitable. Whilst Age of Ultron is fantasy violence (a wonderful phrase if ever I heard one) it's an unremitting slugfest from start to finish. Which really can only start a conversation about overexposure to this sort of thing and the eventual effects of desensitisation. The other side of this is that if you let your children watch films that are beyond their age you can't go back. First of all, they can't unwatch something. Second, you haven't got a leg to stand on if a film comes around that you don't want them to watch ("but you let me watch the other one"). My example, possibly a bit extreme, is this: The Dark Knight was a 12 certificate (should've been a 15, but we'll let that slide). Imagine you've let your under ten watch a 12 certificate movie. Would you then let them watch The Dark Knight? Would you be comfortable letting them watch the Joker go crazy in Gotham, or Batman beating him to a pulp in an interrogation room? I'd hope your immediate answer is no. Films are certificated for a variety of reasons, sometimes due to underlying themes, or language, or violence. But they are certificated for a reason. 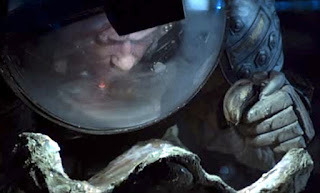 I can't wait to watch Alien with my kids (when they're old enough, just to be clear I'm not a complete hypocrite!) but I'm in no rush. There are plenty of great movies they can watch right now. The purpose of my parenting isn't to enforce the things I love onto my kids. In time I'm sure some of my interests will influence them, but that will come in time. My son has a joke with me that his twelfth birthday is going to be great because he'll be able to watch all the new Star Wars films and the second half of the Harry Potter franchise. And if that happens, that could be one of the best days we spend together. Great Scott! Film heroes part 1. There are certain films, film-makers and actors that have had a profound impact on me over the years. I figured that I'd share some of this from time to time, so to start off this I'm leading with the big guy. A titan of cinema. Ridley Scott. 1977 - The Duellists. 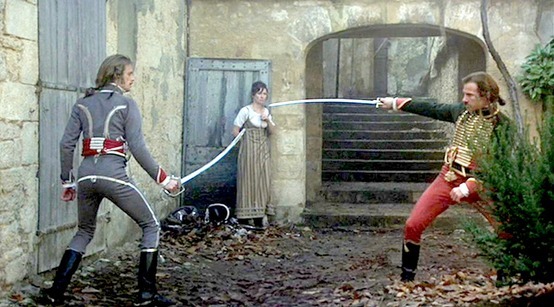 Harvey Keitel and Keith Carradine play the eponymous duo, playing a game of cat and mouse across the backdrop of the Napoleonic era. 1979 - Alien. One of the greatest science fiction movies ever made (just ahead of Dark Star). 1982 - Blade Runner. The greatest science fiction movie ever made (two places above Dark Star). 1985 - Legend. A stunning fantasy movie that bears all the hallmarks of an Arthur Rackham painting brought to life. What brings all of these together, and why they had such an impact on me is the stunning level of detail and craft that went into creating the worlds these films inhabit. Everything is believable, whether its the computers on the Nostromo, the kitchens beneath the demons layer, or the cold that seeps into your bones when watching the retreat from the Russian front. You can almost reach out and touch it and imagine it's real. There's a direct correlation between the film-maker and the artist in all of these films, a sense that set design and the flow of a movie is vital to breathing life into a script in order that it becomes more than just telling a story. In Alien you are brought into a horror movie in a completely alien environment (no pun intended), but it's so rooted in reality that the science fiction elements become even more believable. Eschewing a bright science fiction aesthetic for a more industrial look, Alien essentially put a cast of truckers into space. William Gibson cites it as a major influence on the birth of cyberpunk as, with such a high level of technology permeating the film, the main characters were wandering round in overalls and beaten up sneakers. And this sense of place was carried over into Blade Runner (along with quite a lot of the original sets by all accounts). The Los Angeles of the future is a living, breathing place that on the one hand is futuristic, yet on the other wholly familiar. Still scares the crap out of me. With regard to Legend, this is the sort of dark fairytale that we don't see much of in cinema. It's got a really mythological, northern European feel, and such a distinction between the darkness and the light. The only film in this genre I can compare it to is John Boorman's Excalibur (more on that gem in the future). This feels like an exercise in mood, where the film starts with innocence it quickly turns this ideal on its head. The performance of Tim Curry reminds us that once upon a time he was an actor of rare presence and character. All film posters should be this good. 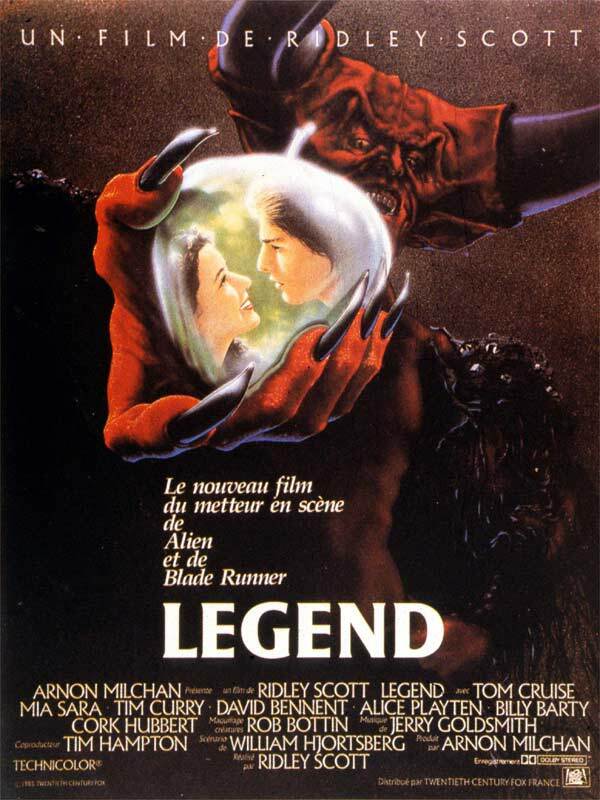 And yes, Ridley Scott's more hit and miss these days. He's made some films that don't live up to these early movies. But for every White Squall, there's a Gladiator. He'll pull Black Hawk Down out of nowhere. And even though he has become the director of choice for overblown historical epics (I'm looking at you Kingdom of Heaven) they are still full to the gunnels of jaw dropping visuals and set-pieces that can leave you breathless. So with new Alien and Blade Runner films due for release this year, go back and have a look at this man's work and you'll see just how much they have to live up to.